The foul smell in my house is a lingering reminder. See, I did not take out the garbage for the second time in a row. No, I'm not in some feat to break a record. The first time I overslept, or rather, slept through most of the day. Yesterday, I only remembered to take the garbage when I was out of the gate. I would have gone back to do it, but time waits for no man. We were two men, son and farther, and the train we were going to catch runs on scheduled time, which again as I just mentioned, waits for no man, or even men. My dad was excited, see, the previous night he had sat through Mombasa Road traffic, which takes hours for those who ply the road and days for those who aren't accustomed. There was an accident, a friendly motorist had hit another one's rear bumper, spinning the vehicle such that it faced oncoming traffic. It's hard to understand why its is a national hobby in Kenya to drive millimetres from the bumper ahead of you. So, my dad wanted to travel to town the following day at a time when they would not be as much traffic. I suggested the train. He seemed eager to enjoy it, see we come from Matuu, where the closest rail line, used or unused, is in Thika. Previously, I have nearly missed my last two trains. The second last time, I actually ran the last 200 metres, was handed a ticket like they hand batons in an Olympics relay race and dashed into the train just in time. For a moment, I almost pulled the Usain Bolt pose in celebration. Then I sat next to this dark, beautiful lady. She had a mini dress that fell just to her knees. Then it started pouring. The running, the hot sun, and the hot lady - a bad combination for one's biological functions. Well, I did borrow some courage and talked to her, for a good 10 minutes. Apparently you can talk to hot ladies the first time - I didn't know this. The second time, I got my timing wrong again, and arrived at the station just as the train arrived. This time, I had a ticket (since they issue a 2 trip ticket for most trips). This time round, there was no hot lady on the train to reward my effort, nor a seat to rest in. You now understand why my poor garbage was left in in the rush to get to the railway station, though we had a good 30 minutes. We got to the railway station 10 minutes before the train was to arrive. My father offered to pay the fare, probably wanting to enjoy the whole experience. Who was I to refuse. As an adult, such offers are usually rare. The train did arrive on time, and we all boarded. I was surprised at the increasing number of people and cars in the station from the last time I had used the service. We boarded the train, and waited for 9:19 am, the scheduled departure time. 9:21 am, 9:22 am, tic, toc, time went by. I was surprised - the train usually left on time. It is then that they announced, a goods train had stalled between Imara and Makadara, and would be cleared in 15 minutes. Probably, after a gruelling trip from Mombasa, the ageing engine had decided that spot was the equivalent of any where else in Nairobi. In typical Kenyan fashion, 15 minutes was drawn into a few minutes short of an hour. Ironically, when waiting for the train, a matatu conductor had shouted at us from the GM flyover that he was charging KSh. 20 to town, in jest. Such foreboding. Well, we passed the 1 hour representing our generations, him reading the paper, me reading all sorts of stuff on my phone - who reads papers? The other passengers, unlucky enough to have smartphones or papers, spent the hour staring, like noticing what shirt the person next to them had, or walking around, or complaining. The 20 minute ride ended up being an hour's, probably shorter than it would have been by matatu. Apparently, the same train we were in had stalled twice since the beginning of the year. I am aware that the Monday evening train arrived 20 minutes late. 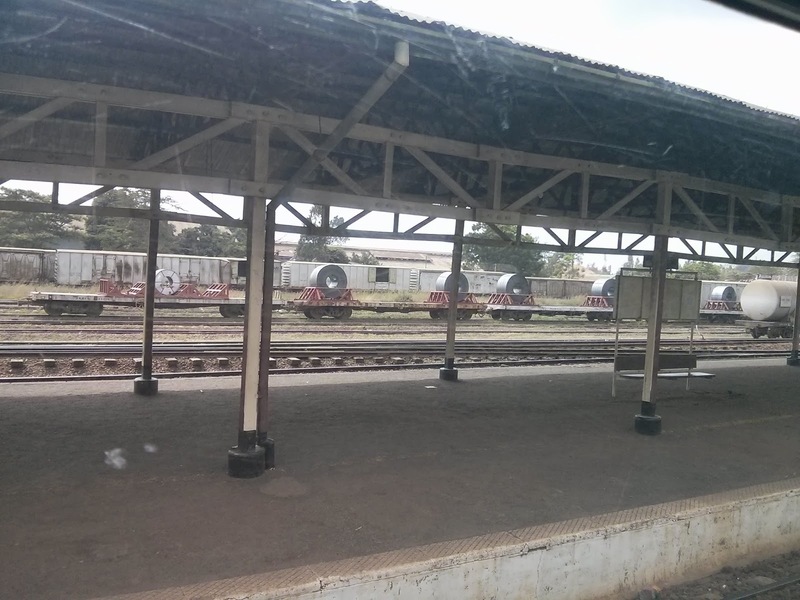 This makes it for 3 stalls for the first 9 days of the year Rift Valley Railways. I wonder why they don't ask those on the train to help in pushing and jump starting the train. 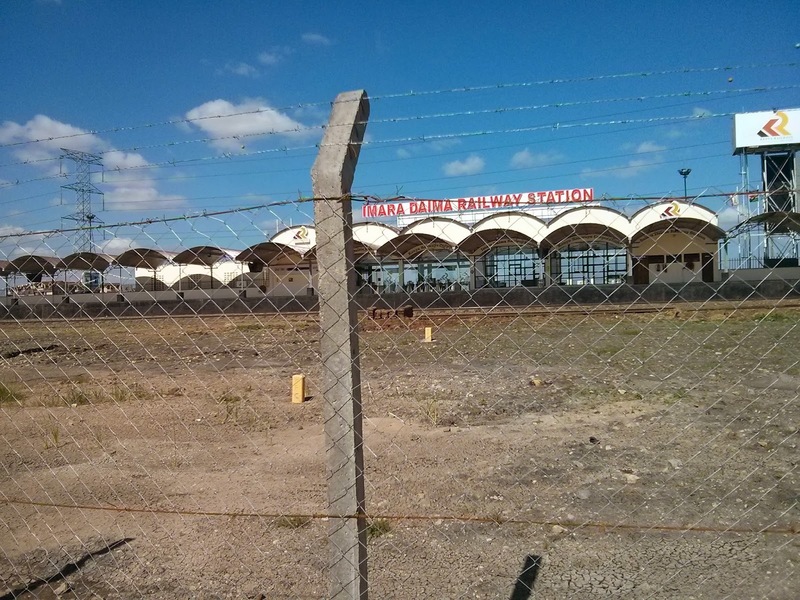 See my first post on a ride on the Syokimau - Imara Daima train.